About a week ago a woman from the Park Slope Courier (and 4 other papers) called me, and I had a phone interview for the paper. The article is in the 24/7 section of the paper this week. 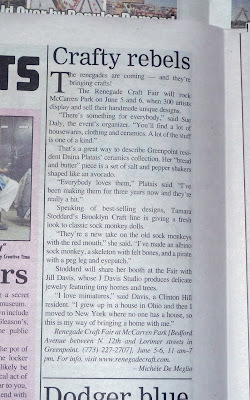 The article talks about Renegade and talks to three of us artists in the fair! I have never been in a newspaper before! Here is a picture of the article! You're kind of a big deal, I tell ya! I have 2 blogs: 1 for craft and 1 for random thoughts. You might want to check out the "Studio" version.